NORWALK, Conn – Middletown’s Mercy Tigers ended Norwalk High’s 2018 girls basketball season with a 55-26 defeat, crushing the Lady Bears’ hope of a state championship and leaving them shellshocked. The captains and Head Coach Rick Fuller Jr. reflected on that loss recently and how it drove them to go harder in 2019. 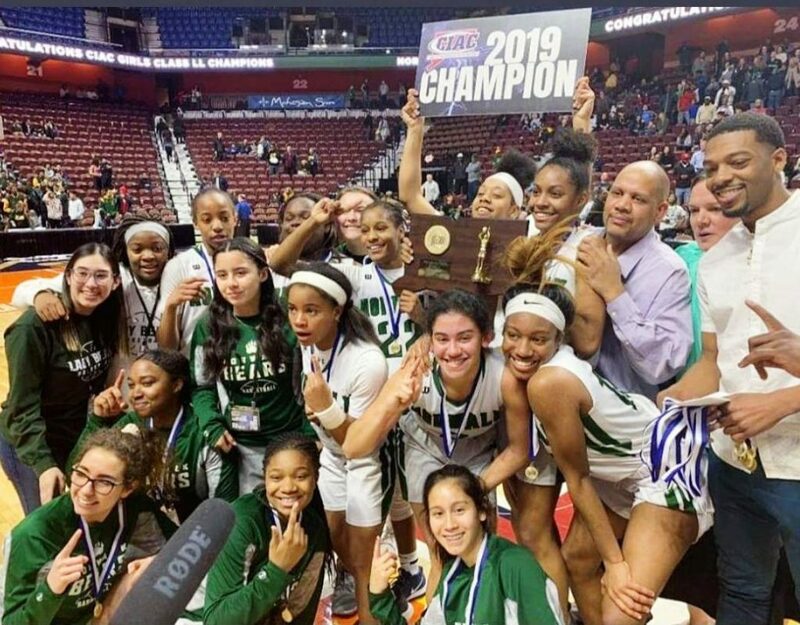 The Lady Bears went undefeated through the entire 2019 regular season, and won the FCIAC crown. The team headed into the post-season determined that this year, it would end better for them. “We didn’t want a repeat of what happened in the quarter finals last year, so we had to work hard to make sure we made it all the way to the end and not get embarrassed like that again,” center Naeva Rene said. Norwalk again faced a tough Mercy team in the quarterfinals. But this time the Lady Bears flipped the script with a 51-49 win. The win over Mercy was payback to the team that “did kind of smack us and do us poorly last year,” Boyd said with satisfaction. In the March 16 state championship game against New London, Norwalk trailed until the game’s final minutes. The girls erased an 11-point deficit, culminating with Wilson tying the score at 53 with two free throws. With 1.7 seconds left, Rene scored with an assist from reserve guard Anaija Morgan, giving the Lady Bears a 55-53 win and the Class LL state championship. If you don’t call it a comeback for Fuller, who has been teaching English and coaching sports at Norwalk High School for 24 years, call it the second time around for the head girls basketball coach. Fuller was Assistant Coach to Fred English when the Lady Bears went undefeated in 2000. It was at a December preseason jamboree in Danbury that Fuller first noted how well the team played, and how they were dominating other teams. It was going to be an interesting season, he realized. The team’s hard work began in November and continued throughout the season, with six days a week of practicing for two to two-and-a-half hours, all while maintaining a team average GPA of 3.0. Fuller said the team’s first big challenge came in January against New London on that team’s turf, but the biggest challenge came five games later against Trumbull. Winning both games boosted their confidence and they looked forward to the post season. Fuller said he made Boyd, Rene, and Wilson tri-captains because of their loyalty, dedication and leadership skills. They’re good kids who come from good families, and set examples on the court as well as in the classroom, he said. Boyd, Rene, and Wilson boast of GPAs of 3.4, 3.8, and 3.5, respectively. The girls and Fuller learned from each other during the journey. Rene learned that hard work over time pays off. “No matter what stage you are in, you can always get better from there,” she said. The captains and their coach reflected on their growth as players and as people. “There were rough times, but (Boyd, Rene, and Wilson) stayed with it. They dedicated themselves outside of the program to getting better and each year they improved,” Fuller said. Boyd began playing in fifth grade, and came to the team with knowledge she learned from her father, “who knows so much about basketball,” she said. But she had an attitude problem, she admitted. Boyd and Wilson have played varsity since their freshman year. Rene began playing with the team her sophomore year, after three years of lacrosse. “Basketball and lacrosse have similarities, but basketball was hard for me because I didn’t know what I was doing,” she said. “I thought I could just run on the court, so I just ran, and (my teammates) were like, ‘no, no, no, you can’t do that,’” she said. “We call her clampers,” Wilson chimed in. “She clamps down on the other team’s best offensive player,” Fuller explained. Wilson, like Boyd, was experienced when she joined the team. “I started playing basketball in first grade,” she said. She started a couple of games as a freshman and was inserted into the lineup right away. “Ashley was thrown into the fire because we needed someone in her position and she’s handled the adversity well,” Fuller explained. Members of the Norwalk community expressed pride in the Lady Bears and their success. Rosa Murray is a former Board of Education member whose granddaughter, Jakara Murray-Leach, is a forward on the team as a sophomore. “The Lady Bears’ success is the result of the team’s and the coaches’ hard work and determination on their journey to becoming 2019 champions,” Murray said. Murray’s granddaughter played on the varsity team as a freshman and was one of the starting five as a sophomore. She was selected by Coach Fuller to play in the 2018 FCIAC Freshman and 2019 Sophomore Classics, and received the 2018 FCIAC MVP award with a game-high of 17 points. “As a parent or grandparent it has always been about support along with parents/family and friends. Together we travel (cheerleaders), donate and work the concession stands during the season,” Murray said. Her family has broad ties to Norwalk basketball — her daughter and other grandchildren played basketball at Norwalk High and her late husband Charles Murray played basketball for Brien McMahon. “I am proud of many things at Norwalk High. One of them, of course, is our girls basketball team. 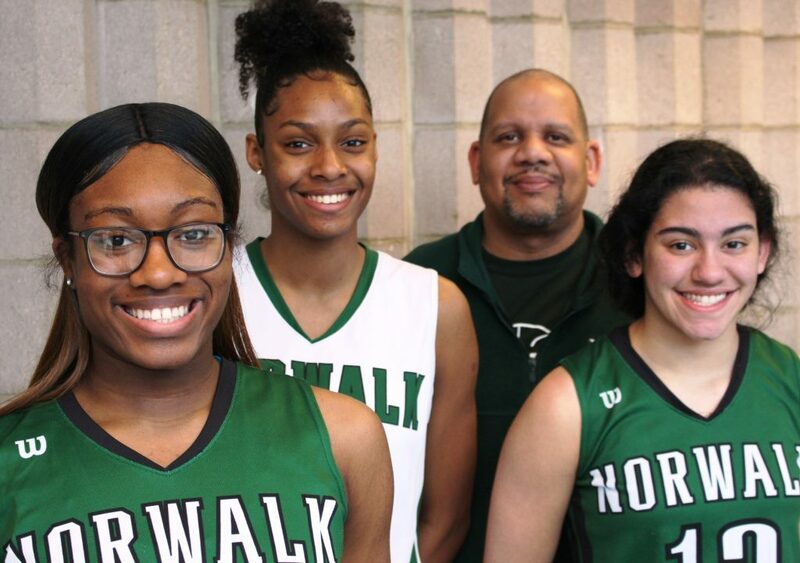 They, Coach Fuller, and Coach Fitzgerald have shown that through hard work, will and talent, we can do anything,” Norwalk High School’s Principal Reginald Roberts said. The Lady Bears tri-captains grew animated when discussing the school’s upcoming celebration of their victory, which will take place April 7 from 4-7 p.m. at the Norwalk High football field. The family-friendly event, which is open to the public, will also celebrate other Norwalk High state champions including Kevin Bradley (swimming Class LL diving), Sam White (Class LL wrestling champion), and the Marching Bears band. Food trucks will be on hand. Next year Rene plans to attend the College of St. Rose in Albany or the University of Bridgeport, where she will play basketball and study business or biology. Wilson will play basketball and study elementary education at Concordia College in Bronxville, New York. Boyd is still deciding on which college she will attend. She plans to study nursing or pre-med, and has decided not to play basketball. “I love basketball, but (college is) just a whole different ballgame,” she said. Whatever their futures hold, the Lady Bears know they have already made some memories they will carry with them for the rest of their lives. “I’m going to look back and tell my kids about it. It’s the best feeling ever,” Wilson said. The amount of discipline, accountability and pure execution that these women have demonstrated here is the stuff of true leadership and role modeling. A perfect season, a championship and maintaining a 3.0 team GPA? Unbelievable. Be nice to these ladies if you see them around town. One day, you’ll be calling them “boss” and hoping that they’ll give you that raise you’re hoping for. Hopefully, they’ll remember your deference. Kill it, Lady Bears. You guys are amazing. So incredibly proud of these amazing young ladies! Well done! AGREED. Totally awesome. What a great story. Congrats! And good luck to the 2020 Lady Bears. That’s not an easy record to follow. Good luck Mr. Fuller! Congrats to the team and coaches. Its so nice to see Norwalk High at the top of the basketball chain again. Hard work pays off. Memories that will last a lifetime.